Nothing can compare to the thrill you get from riding a personal watercraft. Still, if you want your experiences out on the water to be positive ones, follow through the tips below so you can remain safe while riding. Before your feet even touch the water, you need to learn how to operate the vehicle you'll be driving. Reading your owner's manual thoroughly, asking questions to experienced riders, and even taking lessons on riding can be of great help. Doing so will help you control the vehicle more effectively and remain safe while you're out on the water. You could be the best swimmer in the world, but you should still wear a life jacket when you're riding a watercraft. This is because you never know what situation you could get into in which a life saver can be the difference between surviving and perishing. To that end, always wear a life jacket and make your passengers wear one, too. As mentioned above, you should be educated before you drive a watercraft. This includes learning the signs, laws, and rules surrounding personal watercrafts and navigation. Not only that, but you should follow said rules to a T if you want to keep your rides safe, fun, and legal. For example, don't ride with more people than are allowed on your watercraft. You know how dangerous it is to drive a land vehicle while distracted, high, or drunk: your body and mind won't react accordingly to the situations around you, which may lead to a terrible accident. This same principle applies to riding a watercraft: you need to be fully alert so you don't make mistakes that could put you in peril. Needless to say, you don't want to head out on the water with a marine vehicle that is in bad shape. This is because doing so can make way to technical malfunctions that could ruin your ride. To ensure this doesn't happen to you, have a professional mechanic inspect the watercraft and give their seal of approval before you hop on it. If you want to guarantee that you'll have a smoother ride, treat the watercraft's engine to a synthetic oil change with AMSOIL 100% synthetic oil. It will keep the engine protected and performing as expected as you ride the waves. Call TenEyck Distributing at (208) 589-4660 to acquire the best products to maintain your watercraft properly. As mentioned above, it's a very good idea to take your watercraft to a professional before you ride it. However, if you want to be extra sure that your vehicle will endure the adventure before you go, you should still have a quick look at the main components. A superficial inspection round can help you know if your machine is ready. In most occasions, you won't have the whole body of water to yourself, which means that it's probable that you'll find other vessels and people when you ride. If that's the case, remember to keep a safe distance from swimmers, to let larger vessels pass you, to remain on your right if you're facing another vessel, etc. Follow the proper etiquette so you don't cause accidents. 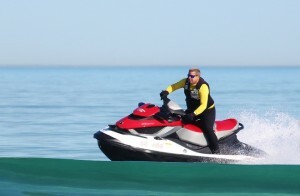 If your personal watercraft has a place to store things, you may want to keep certain safety tools that can help you deal with difficult situations effectively. For example, a flashlight, whistle, first aid kit, and other similar items, can make a big difference if you have an accident while you're riding. Ensure they're in good condition before heading out. As a last tip, use your common sense when you're riding. There's no need to play with fire, so stay away from situations that you know are dangerous. For example, don't ride when the weather conditions are bad, do not speed, and don't try to do stunts. You can have a un day if you just remember to use your common sense. Know that TenEyck Distributing can offer the AMSOIL products you require to maintain your watercraft in top condition. Visit the online store or call (208) 589-4660 if you want to get your hands on the best synthetic oil for your watercraft's next synthetic oil change.